Noisy sirens echoed throughout my spacious New York City dorm, and just like that, I was awake. I normally wake up about 15 minutes earlier, but I was still on track to meet him at the subway station. I needed to hurry that morning, I decided to skip breakfast and grab an apple on the way out the door. It was windy and cold, the sun reflecting off the tall, silver buildings onto the streets below. I rolled up my sleeve to check my watch; I was running late. I quickly stepped down the stairs to go below the street and into the small, crowded Whitehall subway station. "Uptown train to Queens departing in two minutes", I heard as I swiped my subway card through the subway turnstile. I had never talked to him before. I'd always thought about it, but I was hesitant. Today was different, today I was ready. I entered the subway platform and turned to my left hoping he would be there. Crowds of people shuffled back and fourth, today would be impossible to find him. I began pushing through the crowd, hoping to see him. The loudspeaker echoed: "Uptown train to Queens departing in thirty seconds". I stopped walking through the crowd and sat down on an old wooden bench. "Maybe he's not here today", I thought to myself, but just as I began to stand again, a faint tune began playing in the corner of the subway station. I began to listen, focusing my attention away from the noise of the crowd and toward the faint melody, struggling to make itself heard through the uproar of the Whitehall station. Suddenly, the sound of the crowd began to die down as the ear-splitting subway began to approach the station. As I glanced to my left, through the crowd of people, my eyes met a man with a trumpet in his hand. 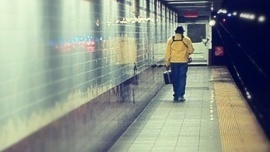 He was wearing a bright yellow sweater as usual, and was struggling to hear his trumpet over the noise of the train. The train doors opened; I was too far to enter the same train-car with him. I entered the train as the doors shut behind me. The passengers grabbed hold of the silver rails lining the top of the train, but I chose not to. I began making my way towards the man with the trumpet. one by one, I opened each train-car door and began walking towards the back of the train. It's against the laws of New York to navigate between train cars, but I didn't mind. I finally began to approach the end of the train, and looked through the last train-car door to see the man in a yellow jacket with a trumpet in his hand. I opened the door, and immediately noticed a particular silence among the train. The other train-cars were noisy, drenched in the noise of people on their cell phones. This car was silent, the passengers in awe of the only noise that made itself echo throughout the car: the trumpet. I walked slowly passed the passengers in awe; their eyes focused among the man in the bright yellow sweater. He was relaxed and confident as usual. I sat down and began to listen. Note after note, the trumpeter played loudly and confidently. As the train began to screech to a stop, the trumpeter ended his melody and began packing his trumpet away. I approached him, "That was amazing" I said. There was a long pause, his eyes stayed locked on the ground. "I hear you every morning and you always make my day", I explained. Still looking down, there was no response. Finally, he slowly looked up and his pale brown eyes looked into mine. For what seemed like minutes, he stared into my eyes, only to be interrupted by the subway doors opening. Before he made his exit, I put a five dollar bill in the hat he was using to collect change. He looked up and smiled, then raised his hands towards his chest. "Thank You", he gestured in sign language. He made his exit as the subway doors closed behind him. "Uptown train to Queens departing", the loudspeaker echoed.